I was prepared not to like this recipe as the directions I received were kind of sketchy. But I've made them twice now in three days, at my husband's request, so I'd say we have a winner. Where the instructions were vague was just what size to roll the dough out to, how thin to roll it, how many bread sticks a recipe should make. So I just did what I thought was best, and we love the results. If you're serving people with small appetites, you could probably cut them in half once they're baked. We do not have small appetites. So we leave them -- large, irregular, a little goofy looking. But delicious. And more bread-like than bread stick-like. But enough of the chatter. In bread machine pan, place water, flour, sugar, salt, and yeast. Put machine on the manual "dough" setting and push start. When cycle is through, remove dough to well-floured board. Pat it down into a rectangle, about 6 inches by 12 inches. Melt the butter and pour it onto a cookie sheet with sides. Swirl the butter so it thinly covers entire sheet. With sharp knife, cut the dough into 12 strips, approximately 6 inches by 1 inch. Place dough strips onto cookie sheet. They should all fit onto one sheet. 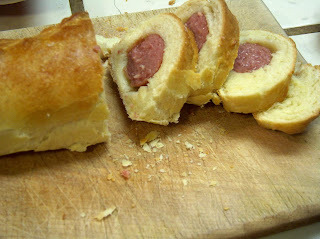 Bake at 350 degrees for 9-10 minutes; pull out pan and use a fork to flip the sticks over and bake for another 10 minutes. That's it. 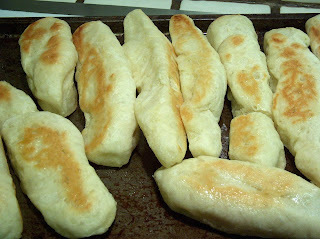 Anyone else ever made homemade bread sticks? I'd love to hear how you make them. Note: for more recipes or food ideas, check out Tempt My Tummy Tuesdays. Well it's a little early for National Banana Lover's Day (August 27) or the International Banana Festival (September 21). But just try this little snack/dessert idea anyway, and if you like it, tuck the recipe away for those special upcoming events. Take one banana. Slit it down the middle, taking care not to go all the way through the underside of the peel. 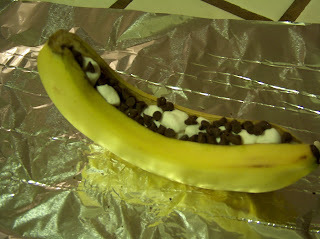 Stuff into the cavity as many chocolate chips and mini marshmallows as you can fit. Wrap it all in foil and put in the oven, set on broil, for 8 to 10 minutes. Open foil expectantly, and dive in with a spoon. And remember, you're eating fruit! So it hardly counts as dessert, don't you think? I learned a few lemon tips today. Such as, a lemon will yield twice as much juice if you freeze it before squeezing. And putting salt on a lemon half will clean the lime buildup off sinks and faucets. For more fun lemon facts, and to read the first chapter of author James Watkins' new book, Squeezing Good Out of Bad -- with a lovely lemon cover, I might add -- check it out here. Note: Hop over to Works for Me Wednesday to read ideas, ideas, ideas galore. Really, if you can get through all of them, you are truly amazing. I am thrilled to be able to report that this year the deer have bypassed our little tree as their midnight snack, and have left all these beautiful yellow jewels for me to grate and squeeze in my neverending quest to locate mouth-watering recipes. I know, work, work, work. But someone's gotta do it. May as well be me. 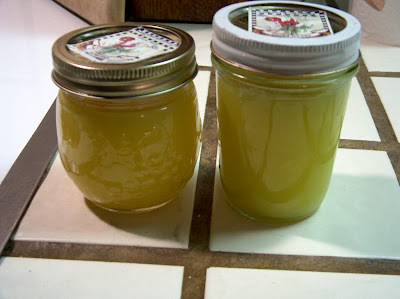 I have bought lemon curd occasionally in the past, to spread on scones or muffins or to plop into the center of blueberry muffins as they bake. (Two thumbs up on that idea, by the way.) But I'd never tried making it before. 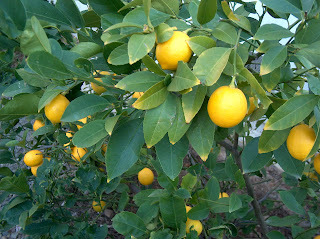 This year, thanks to the restraint of Bambi and co., I have plenty of lemons with which to experiment. It's not at all hard -- though it does take some patience to keep stirring until it thickens (maybe 15 - 20 minutes). But it takes the juice of just three lemons and the peels of two, and you end up with one jar to keep and one to give away. Seems like a pretty good deal, to me. The recipe, by the way, comes from Homemade Christmas: Holiday Recipes, Gifts, Decorations and Memories to Treasure, by Mary Harvey Gurley. I know, I know, Christmas is over, but I already told you last week. I am not done. In medium saucepan, place sugar, butter, lemon peel and lemon juice. (The official recipe recommends you use a double boiler, but I never use double boilers, preferring just to keep the pan on low heat. If your stove runs hot, you may need a double boiler. My stove, on low, is barely even on.) Place over low heat. (Again, low heat is hardly even warm for me, so I used medium-low, then gradually moved it up to medium.) Cook until butter melts, then stir in eggs with whisk. Keep whisking until it thickens, about 15 - 20 minutes. (The book warns you not to let it boil or it will curdle.) Pour into jars and enjoy your lovely lemon curd. 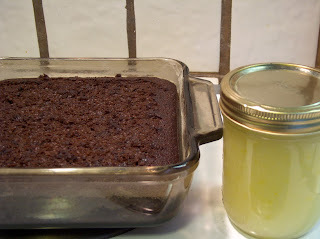 Anyone else have great lemon recipes to share? Note: Check out Tasty Tuesday for more great recipes. Equally important note: see Tightwad Tuesday for great money-saving ideas. I highly recommend DarcyLee's Oatmeal Drop Cookies, which can be found here. 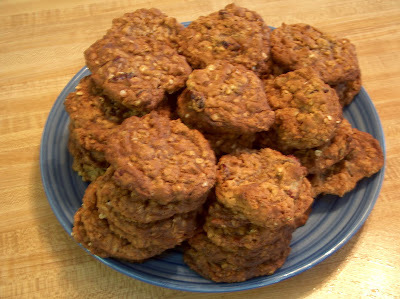 They are yummy with oatmeal, molasses, raisins (I used dried cranberries), and nuts. Delicious. Thanks, DarcyLee, for sharing. This one's for you, Smily. Preheat oven to 375 degrees. Grease and flour an 8 x 8 inch pan. Set aside. In medium bowl, mix flour, baking soda, salt, cinnamon, ginger, and cloves. Set aside. In large bowl, beat egg, molasses, butter, and water with electric beaters until well mixed. Add in flour mixture and beat until smooth. Pour into pan and bake for 25 minutes, until toothpick inserted in center comes out clean. Let cool, then cut into 9 squares. In small saucepan, mix sugar and cornstarch. Add water and stir, over high heat, until boiling. Reduce heat and simmer, stirring, until mixture thickens and turns transluscent. (This will take just a couple of minutes.) Remove from heat, stir in butter, lemon peel, salt, and lemon juice. Cool slightly, then serve over slices of gingerbread. Bring on the leftover rice! This recipe for fudgy rice pudding is so delicious, it might even have you making extra rice on purpose. One recipe serves two or three, so multiply accordingly. In medium saucepan, combine rice, milk, sugar, salt, and butter. Cook over medium heat about 20 minutes, stirring occasionally. The last few minutes, as mixture begins to thicken, stir more often. Stir in vanilla. Place in small dishes, sprinkle chocolate chips (or bits) over pudding, and enjoy your feast. Note: For more great ideas, go check out Works for Me Wednesday here. A super easy recipe from my mom, for those of us who like blue cheese. Love that mom. Mix the cheeses, garlic, and parsley, if you're using it. 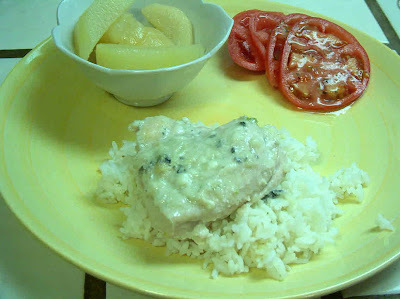 Place chicken breasts in baking dish, spoon cheese mixture over it, cover, and bake at 350 degrees for one hour. Serve with rice as it makes some delicious, soppy juices. Serves 4. You can also substitute feta cheese, sun-dried tomatoes, and fresh chopped basil leaves for the blue cheese and parsley; I'm trying that version next. Note: For more ideas of things to make, check out links for Make Something Monday here. That once the cold weather hit, you could pull up from the garden some of these . . .
Wrap them in this . . .
Set them aside for a week or two or three . . .
And end up with this!?! If you don't wrap your green tomatoes in newspapers, by the way, and just set them in the windowsill in hopes of wintertime ripening? They'll shrivel. Just thought you'd wanna know. 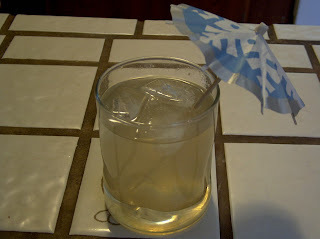 you will end up with a nice cold glass of subtly fruity lemonade. And what could be more frugal? Note: Check out Works-For-Me Wednesday for more great ideas. 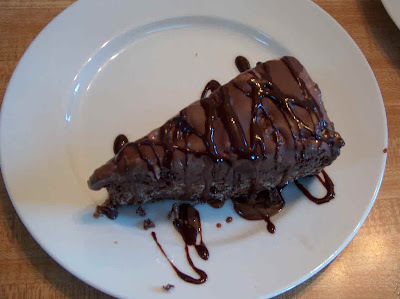 Also, see Kitchen Tip Tuesdays at Tammy's Recipes for even more yummy suggestions. Don't you just love treats with Rice Krispies in 'em? Mixed with chocolate, peanut butter, butterscotch chips, marshmallows, just about anything you add to the crispy little critters, you can't go wrong. Their very presence yells, "PARTY!" So with this simple concoction, a crunchily delicious pie crust that you smush into the bottom of a pan then top with softened ice cream. Add, of course, any other toppings you find crucial to your happiness. Butter a springform pan (the kind you use to make cheesecake). Set aside. Pour Rice Krispies into large bowl. In saucepan over low heat, melt chocolate and butter. Pour melted chocolate mixture over cereal and stir to coat. Pour cereal mixture into prepared pan. Smush down to make crust. (I use plastic wrap and my hand to do the smushing.) Freeze for about 30 minutes. After about 15 minutes, take out from the freezer your favorite ice cream flavor (or three) and set on counter to soften. When ice cream has softened (about 15 minutes), remove crust from freezer, and fill with the ice cream. One regular carton of ice cream should be enough, or three smallish, Ben & Jerry's-type cartons for a special occasion. Fill 'er up. Place back in freezer to harden a bit. A few minutes before you're ready to serve, remove sides of pan. Cut pie into wedges (warning: the crust will be firm and a tad bit of sawing with serrated knife necessary). Top with chocolate sauce, raspberry sauce, marshmallow sauce -- whatever floats your boat. Note: For more great kitchen tips, visit Tammy at Kitchen Tip Tuesdays. One of the biggest blessings of 2008 for me was discovering that the prayer organization Moms in Touch has groups for moms of college and career-aged kids -- and even for grandmas, too. If anyone thinks they might be interested in meeting to pray for their kids an hour each week, I would highly recommend you check it out. What lead me to this group, you ask? (OK, maybe you didn't ask. But here's what happened.) In the process of writing this magazine article last year, I met so many amazing, lovely women over the phone and via email -- the kind of women who made me think, "That's who I want to be when I grow up" -- that once I concluded my interviews, I just had to join a group myself. It was, without a doubt, the absolute best thing I did last year, for so many reasons. I'd be happy to blather on some more, if anyone wants to email me (or leave comments) with questions. But I'll shut up now since this is, indeed, a recipe blog, and Lord knows I'm having a hard enough time staying on topic already. How can Christmas be over when there are still so many Christmas recipes to try?! My motto is forge ahead; keep baking Christmas goodies until the urge passes. So that's what I'm going to do. Today's entree came from a book written by one of my very favorite cookbook authors, Susan Branch. If you haven't seen her books, you MUST check them out. 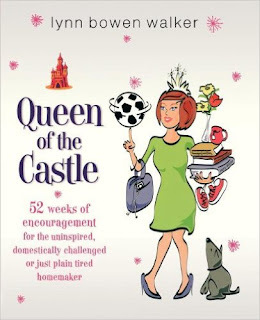 They are charming, illustrated with her very own lovely, lovely watercolor paintings. In Christmas from the Heart of the Home, Susan explains how to make this without a bread machine. I do all my yeast bread baking with a little help from kitchen appliances, so I'll just give you my cheating little bread machine directions. Set machine on "dough" option. When dough is ready, take half of it and smush it out into a 4" x 12" rectangle on a floured surface. and cut it in half. You'll have two long hot dog-shaped pieces of meat. Put one of the halves in the middle of the dough you just smushed out. Bake at 375 degrees for about 20 minutes, until brown. Slice with a bread knife, and serve with mustard. 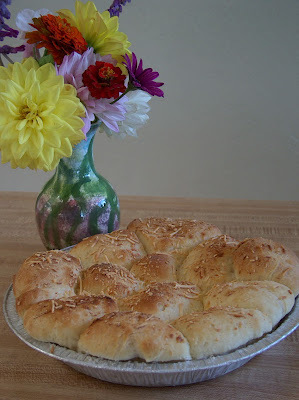 We had this with soup for dinner, but you can also serve as an appetizer. And I really don't think anyone needs to know it came from a Christmas cookbook. Shhhhhhh. Does anyone else love Susan Branch cookbooks?